This product smells delicious, like a pina colada! It absorbs well and will not leave the skin feeling greasy or sticky. It is excellent for those with dry skin or who want to smell nice! Discreet enough to give as a gift or leave out while functioning perfectly! A fantastic 5 star product! Smells great. Moisturizes well. Discreet packaging. Glow-rious glistening body lotion is a body moisturizer that leaves your skin feeling soft and glowing, a faint glitter in the middle of it all! This is a scented lotion and mostly directed towards the female crowd. This lotion is thick enough to not run off of the skin but thin enough to not feel too heavy. It does not leave the skin feeling weighed down and even when used on the face does not feel like it will clog your pores. It soaks in well, just leaving the skin feeling hydrated without an extra mess on the surface. When you squeeze it out of the bottle, a little goes a long way and it pours slowly enough so that you will not get it everywhere. It is a whitish color, not clear or see-through in the least. It also spreads easily and does not clump up at all. If it needs to be washed off, soap and water with a washcloth will do the trick easily with no fuss! Cake combined a pineapple with vanilla scent that reminds me of a pina colada. I feel like I am in a hammock with a drink in my hand every time I pop the snap top to this bottle! I did not taste it, of course, since it is not edible, but it makes me crave pina colada! The aroma is not too strong inside of the bottle, but certainly noticeable. Applied to the skin, the aroma can be smelled from a few feet away for a couple of hours but after that, it seems to wear away. At that point, if one were to get very close to you they may smell it, but otherwise no one would notice you are wearing a scented lotion. It is not so strong as to give someone sensitive to smells a headache, but strong enough to make the application of a scented lotion worth it! If not washed off, your skin will stay moisturized through most of the day. About 6-7 hours if you are not doing anything that may rub it off, but after that reapplication is needed. There is a shimmer to the lotion, not like actual pieces of glitter but just enough to leave a nice shine on your skin! It looks very nice and leaves a pretty glow to the skin! Especially if you are darker or have a tan! The scent as stated above will last for a good while even when it dies down a bit. What is fantastic about this lotion is really the smell. I enjoyed the fact that it has a unique scent and is very soothing, actually! I wish that it did last longer, though! Water (Aqua), Caprylic Capric Trigylcerides, Glycerin, Cetearyl Alcohol, Stearic Acid, Aroma, Dimethicone, Simmondsia Chinensis (Jojoba) Seed Oil, Glyceryl Stearate, PEG 100 Stearate, Triethanolamine, Mingifera Indica (Mango) Seed Oil, Polyquaternium 7, Polysorbate 60, Carbomer, Calcium Aluminum Borosilicate, Phenoxyethanol, Caprylyl Glycol, Carthamus Tinctoris (Safflower) Seed Oil, PEG 150 Stearate, Steareth 20, Benzophenone 3, Tetrasodium EDTA, Silica, Aloe Barbadensis Leaf Extract, Sorbic Acid. May Contain: MICA (CI77019), Titanium Dioxide (CI77891), Iron Oxides (CI77491, CI77492, CI77499) D&C Red #6 Lake (CI 15850:2), D&C Red #7 Lake (CI15850:1), D&C Red #27 Lake (CI145410:2), FD & C Blue #1 Lake (:CI142090:2), FD & C Yellow #5 Lake (CI 19140:1), FD & C Yellow #6 Lake (CI15985:1), Bismuth Oxychloride (CI77163), Chromium oxide green (:CI 77288), Chromium hydroxide green (CI 77289), Ferric ferrocyanide (CI 77510), Manganese Violet (CI 77742), Ultramarines (CI 77007), and Tin Oxide (CI 77). Reviewed by AnnRob (Eden Advanced reviewer) Figuring this nice place out! 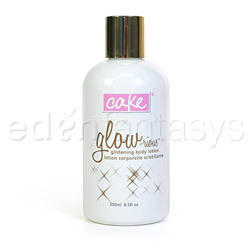 Thank you for viewing Glow-rious glistening body lotion – body moisturizer review page!